I'm not the first person to admit that I don't have the firmest grasp on quantum mechanics or the computational mechanics that utilize them. Sure, I'll bust out the Schrodinger's cat situation at the many intellectual gatherings I'm totally invited to, but that's where my familiarity with all things quantum ends. Google's Quantum Artificial Intelligence Lab wants that to change for the world's youth, and found the best way to accomplish that task was through non-other than Minecraft . In a recent blog post , Google says its modpack, which you can download here , will help teach players about "quantum entanglement, superposition, and observer dependency." I never got into Minecraft the same way others did, but I'm constantly impressed by how people are expanding the definition of what a game can do. 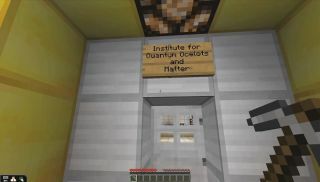 We've already seen someone build a 16-bit computer inside Minecraft, so what's a couple steps into quantum territory? I don't know, but I guess that's what this mod is for.